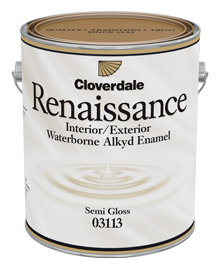 A premium quality interior /exterior hybrid waterborne alkyd enamel that provides the toughness and durability of alkyd or oil-based paints but in a low VOC, water-based formulation. This semi-gloss product offers good flow and levelling performance combined with good sag resistance for easy application by brush, roller or spray. Excellent water and abrasion resistance to withstand repeated scrubbing and wear and tear. Good adhesion, coverage and weather resistance make this the ideal replacement product for the older oil-based alkyd enamels.